This book seems just like my cup of tea! I have some intrest about the 1969 moon landings, I personally feel that they mannaged to fake it, that's my gut instinct. Hopefully you can try and convince me in your book that they wern't fake. Also, where will I find a copy of this book? Do any shops in Britain sell it? By the way, great cover for the book! JaiGuruDevaOm, Good to hear from you, and thanks re the book cover. You can easily get the book at http://www.amazon.co.uk (softcover or e-book). There have been a number of web postings pertaining to the "Apollo 11 hoax." They are mostly based on the photographs taken by the crew (shadows, sun ,...). After you've read the book, let me know if you still suspect a hoax! Into The Sky With Diamonds, by the "voice analysis", do you mean the one Tony bramwell did? RevolvingPiggies, Thanks for the post. 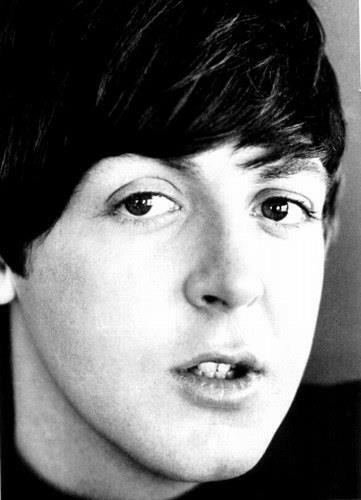 The voice analysis was from a professor in Florida (Henry Truby at U of Miami); his conclusion was that the pre-1966 McCartney was not the same person as the post-1966 McCartney. Go figure! Thats interesting. I was thinking of how Tony Bramwell called a radio station claiming to be Paul and how he was alright to stop the rumors, but some people said the voice wasn't from the real Paul's, so people though "so Paul must be dead if someone pretends to be his voice!" Good example of how when you believe something strongly, you find things that will bolster that belief! February 1962. While Brian Epstein knocked on frigid London doors hoping to get his boys a contract, John Glenn readied himself for the most important moment of his life – in fact, one of the most important of the 20th century. Kennedy had challenged his country to get a man to the Moon and back by the end of the decade, presumably ahead of the Communist Soviets. The Soviets had already sent a man orbiting the Earth, while the U.S. had just two measly cannonball shots under its belt. On February 20th1962, after no less than ten delays, Glenn finally went up - the first American to orbit the Earth. However, in the middle of the mission it looked like disaster would strike: A light in the cockpit suggested a loose heat shield. Had this been the case, Glenn would have disintegrated upon re-entry (as would a Space Shuttle decades later), and today’s political map might look quite different. Of course he didn’t disintegrate; instead, he got a ticker tape parade down the canyons of Manhattan. To his credit, Glenn never financially cashed in on his fame. He remained a civil servant, becoming a four-time Senator from Ohio. At the ripe age of 77 …. he returned to space on a Space Shuttle. He’s still the oldest man to have flown in space. Glenn turned 90 this past year. Dont know if you saw it or not ITSWD but the Beatles Examiner has posted a review of your book. Quite complimentary to the book and yourself it is. Geez, meanmistermustard, thank you SO much for pointing that out. I'd completely missed that. Would have been very awkward for me not to thank Steve Marinucci. Actually, I was just thinking of you yesterday: the attached picture is the back cover of this week's Newsweek magazine. Will be a perfect addition to my Beatle/Space lecture. Thanks for the Snoopy and Woodstock pics, i love anything and everything Peanuts [comic strip], the cartoons always make me laugh. 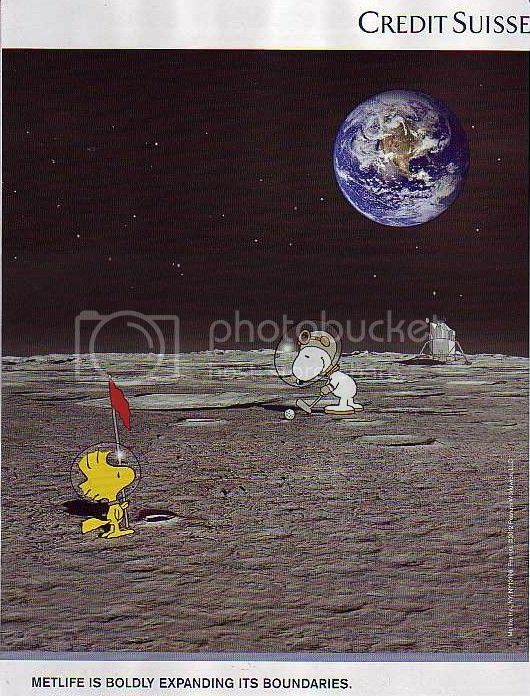 On the trivia question I have no idea who played golf on the moon. I only know 2 of the 3 who were first there, the third guys name was on Pointless last week and ive forgotten completely. Shepard is better known for being the first American in Space. 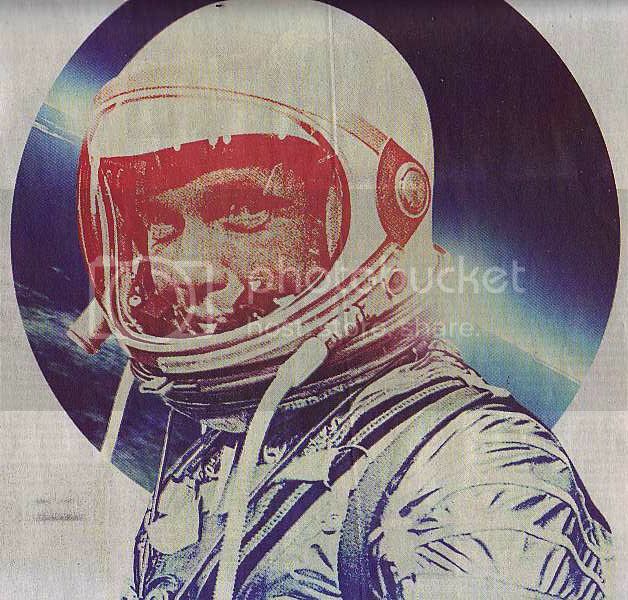 He was America's greatest astronaut hero until John Glenn came along less than a year later. And of course Glenn himself was eclipsed (so to speak) by Neil Armstrong. [Shepard is a good example of perseverance and "hanging in there"
Following his little cannon-ball shot into space, he was grounded with an ear condition (Meniere's). Nice article in the Wall Street Journal on Into the Sky with Diamonds and Beatle/Space memorabilia. You have a copy of I Want To Hold Your Hand SIGNED BY THE BEATLES? And you thought for some reason this wasn't worth mentioning until now? And that edition of Datebook SIGNED BY JOHN LENNON? Oh my. You're so very, very lucky. Joe, thanks. 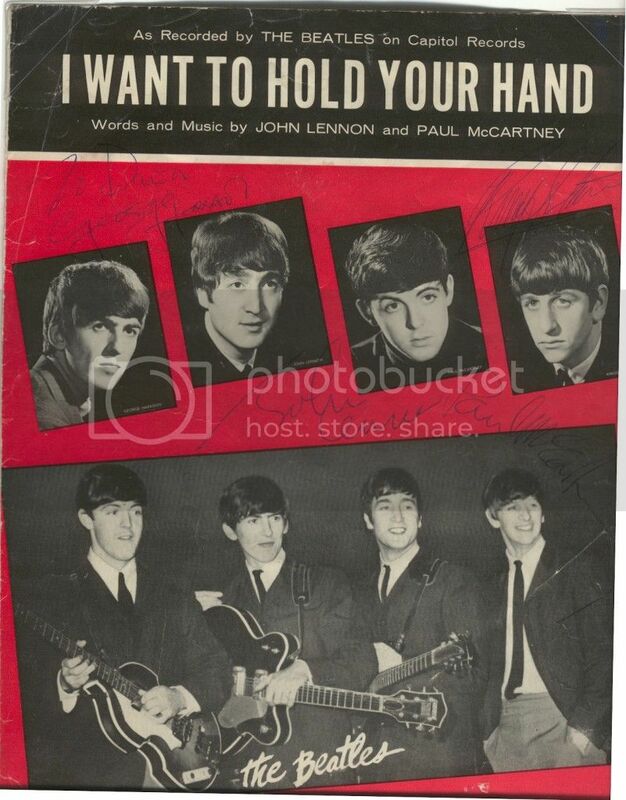 It's actually the sheet music for "I Want To Hold Your Hand " that I have signed by all four, but I love it. Although it was their 4th hit overall, in the U.S. it's still considered their first hit, since that's the song that made them famous here. Emotionally, it is for me, that's for sure. That really is very cool. Please do share your collection - I'd love to see more. 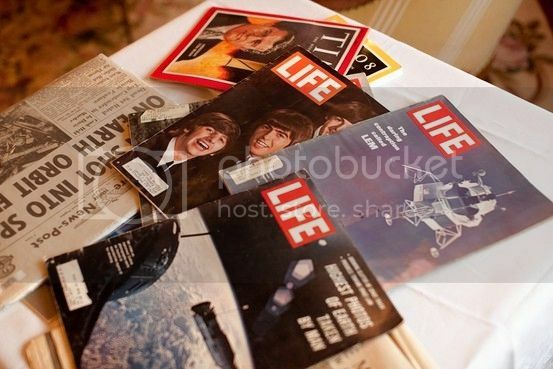 The picture or memorabilia that accompanies the article shows dolls of Paul and John that belong in the same set my older cousins had displayed on their walls when I was just a little kid. Those were the cousins that turned me on to the Beatles. That just brought back a flood of mighty fine memories, Doctor. Thanks a ton! And I'm with Joe - if it's possible to photograph more of your collection, I would enjoy seeing more. OK, here's an inexpensive piece of memorabilia. I like it because the depiction of the Yellow Submarine is very different from the one we've come to know and love. This is basically a fish with a periscope. It gives me the opportunity to ask people who visit, "Any idea why this yellow submarine is so different from THE Yellow Submarine ?" 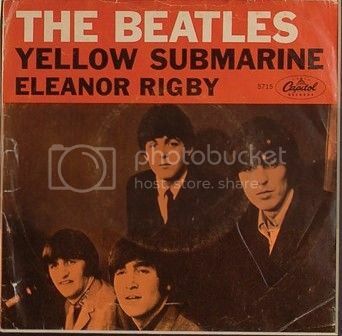 Sleeve of the US single for Yellow Submarine ? The answer is that when the song came out (summer '66), it was ... just a song. 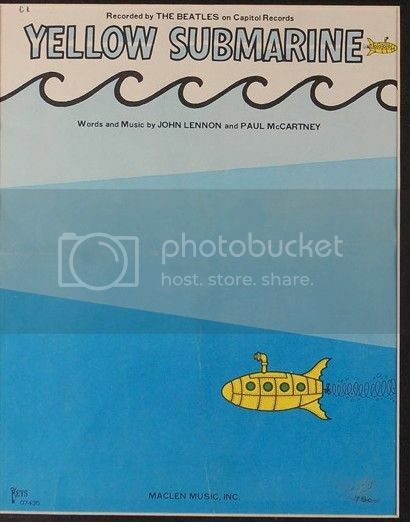 The music publishers weren't going to knock themselves out drawing some fancy submarine just for the sheet music. 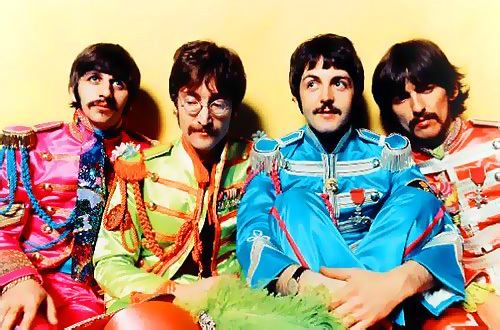 It wasn't until 2 years or so later when United Artists decided to make the cartoon that time was expended to create THE yellow submarine. (this is where memorabilia can be fun). 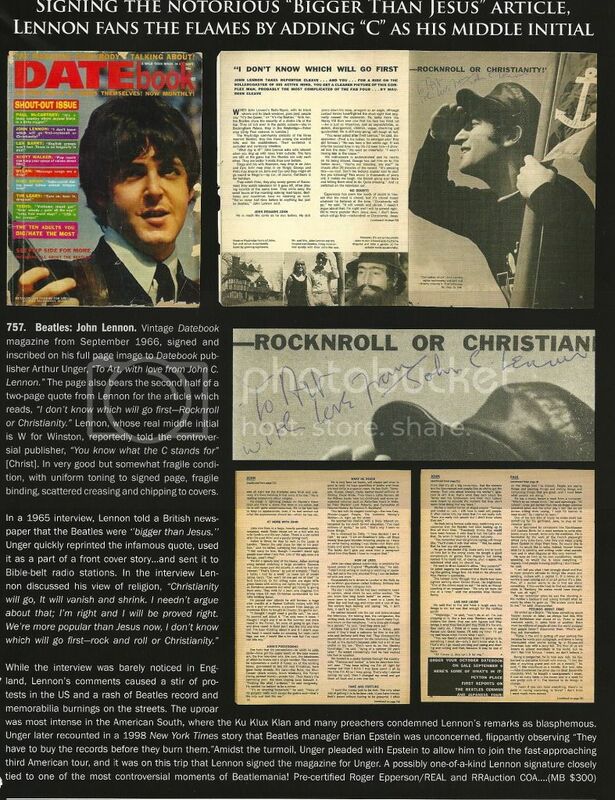 So here's the infamous "Beatles more famous than Jesus" article. It appeared in the teen magazine "Datebook" in August 1966. It was an excerpt of a long interview given in Britain around March of the same year. Lennon had covered a wide range of subjects and had raised nary an eyebrow. When the interview was reprinted in the US, again no one paid much attention. It wasn't until it appeared in this teenager publication that all hell broke loose. The fact that Lennon signed the article "John C Lennon" suggests that he's in a playful mood - the fit hadn't hit the shan yet.